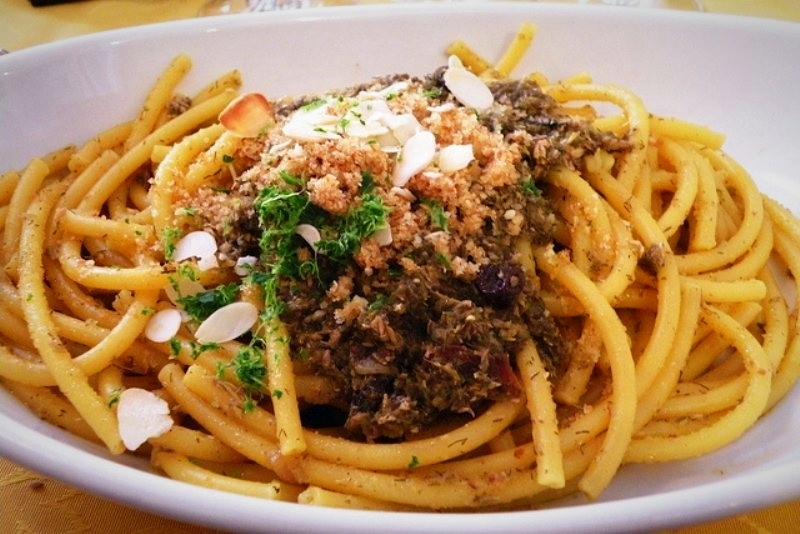 Pasta with sardines (pasta con le sarde) - one of the main symbols of the Sicilan cuisine. This dish, originated from Palermo, is very popular in Sicily, and is being cooked from March to September, when fresh sardines are sold on fish markets. This traditional dish is very easy to cook, and you will surely enjoy its magnificent and aromatic taste. Just try it! 1. Bucatini, spaghetti or linguine - 400 gr. 2. Fresh bushy fennel fronds - 500 gr. 3. Fresh cleaned and filleted sardines - 400 gr. 4. Tomatoes - 100 gr. 5. Pine nuts - 50 gr. 6. Dry bread crumbs - 50 gr. 7. Currants - 20 gr. 1. Simmer the fennel fronds in a large pot of salted water until tender, about 4 minutes. Then chop the fronds finely with a large knife. Do not discard cooking water. 2. In a large skillet, stew the finely chopped onions, garlic and pine nuts in 3 tablespoons olive oil over medium heat until softened. 3. Add the diced tomatos and stew about 3 minutes more. 4. Add the cleaned sardines, saffron, currants and the chopped fennel fronds. Add a little of the fennel cooking water and cook for 5 minutes more. 5. In a small skillet, toast bread crumbs in 1 tablespoon olive oil until golden. Season with salt and peperoncino. 6. Boil the bucatini in the fennel cooking water. Cook until the pasta is on the firm side of al dente. Add the pasta to the pan with onion-sardine mixture and gently toss together. Taste and correct seasoning. 7. Transfer to large plates, sprinkle with bread crumbs. Add a drizzle of olive oil, if desired.